I found this tutorial for these cute pompoms using cupcake liners. I loved them when I saw them and to make it even better, they're so easy to do. I love easy! And fast! The wreath took the longest and it only took me about 40 minutes. I didn't count how many liners I used but it was about 1 - 1 1/2 boxes of liners depending on the size of the pompoms. I was throwing a Girls Night for a friend's baby shower and was doing a cupcake bar, so I thought it'd be fun to decorate everything with cupcake liners. I also threw the party a week before Valentines Day so I kept up some of the decor (most of them I gave away to be used for the baby to be) since they're so frilly and fun. If you use a different color than white, wrap the wreath with matching ribbon underneath so you won't see any holes peeping through. 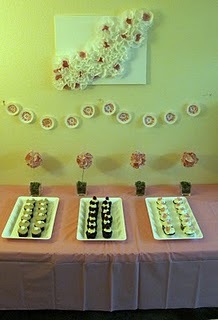 My wall art and my banner says "oh so sweet"
Plus, here's a couple more cute ideas using cupcake liners.